Coriander, Chilly, Cumin, Black Pepper, Clove, Cinnamon, Fennel, Mango, Salt, Tej Patta, Badian, Big Cardamom, Turmeric & Trifal. Heat 3tbsp. of ghee-add chopped onions (3-4), garlic sticks (9-10), tomatoes (3-4), 3tsp. 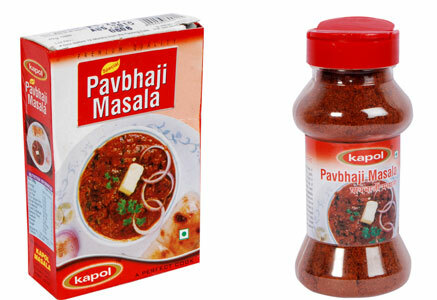 of KAPOL PAVBHAJI MASALA, 1tsp of Kashmiri Chilly Powder, and Salt - mash & cook for 5 mins. Add boiled vegetables like green peas, potatoes, cauliflower and capsicum and again mash and cook for 10 to 15 mins. Pavbhaji is now ready to serve, while serving sprinkle chopped coriander leaves and butter on bhaji, serve chopped onions, Pav (bread slightly heated with butter) and a piece of lomon along with bhaji.